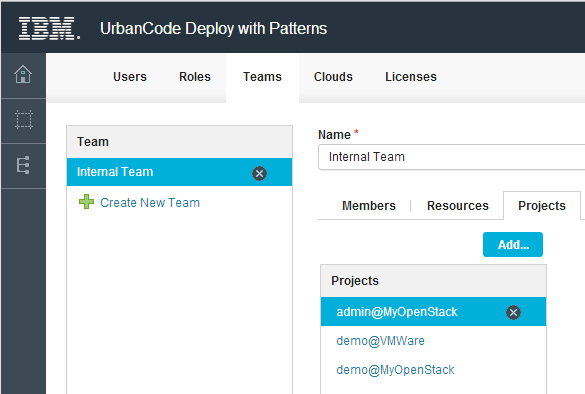 Since writing up UrbanCode Deploy with vSphere and Chef I’d managed to trash my ESXi/vCenter setup so I recreated it from scratch. First I installed ESXi into a VMware VM and then imported the vCenter Server appliance into another VM. I also created an Ubuntu 14.04 x64 VM, installed cloud-init into it and cloned it to a VM template. To make life simpler for all concerned (well, me:-) I put the ESXi Management network, the VM network and the VCentre server all on the same virtual network as my UCD+P/UCD VMs and turned on promiscuous mode and forged transmits on vmnic0. The Ubuntu VM needs cloud-init so UCD+P can do the “install and start the UCD agent” bit auto-magically on a new VM (see my last post about the user_data section in the blueprint). The updated version of UCD+P also has some changes in how the authentication and authorization is configured (see “Cloud Projects” in the UCD+P Knowledge Center). Essentially I will still get UCD+P to use the same OpenStack Keystone service for identities as before. 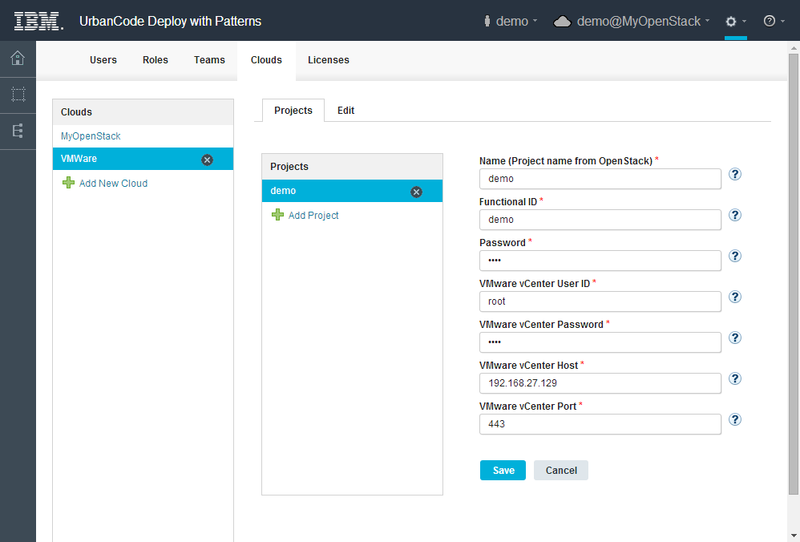 However I create a new Cloud Project that maps an OpenStack project (tenant) and user to a VMware vCenter user. I also need to assign the project to a team. Now when I login, I authenticate as the “demo” OpenStack User and use the Projects menu to access and use compute resources from vCenter/ESXi. Now click “New..” in the Blueprints page, give the blueprint a name, select “Blueprint” for Type and click Save. The Compute drawer of the palette on the right of the blueprint shows the VM Templates available in the vCenter server. Drag and drop the “UbuntuCI” Compute resource onto the blueprint and save it. Next open the Component drawer, which shows the UCD components, and drag and drop the mtm.app, mtm.db and mtm.web components onto the ubuntuCI Compute resource. Select each of the components on the compute resource and set the Version property to “1.0” and the Component Process property to “deploy“. 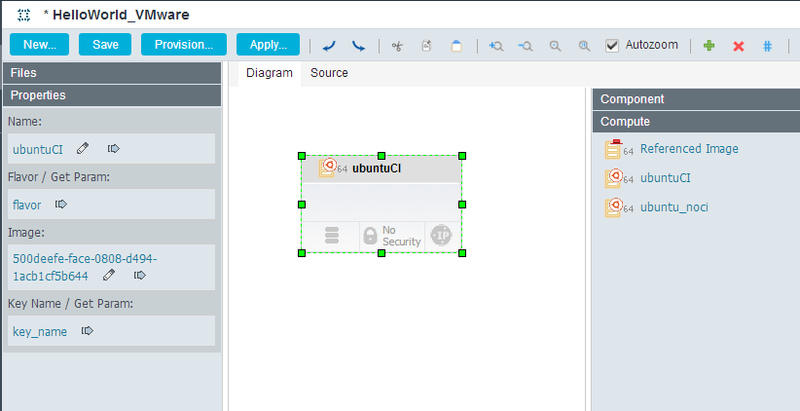 With this we’ve instructed UCD+P to provision a new VM based on the ubuntuCI template, deploy the UCD agent to it, and invoke the “deploy” component process for each of the mtm.app, mtm.db and mtm.web components on it. UCD 101 says that usually the Application process orchestrates the order in which its components are deployed. In UCD+P we use the Deployment Sequence policy to achieve something similar. 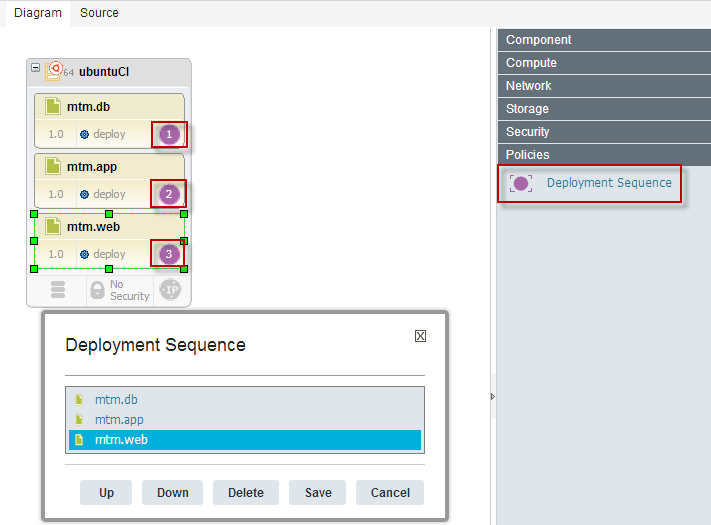 Expand the Policies drawer in the palette and drag and drop the Deployment Sequence policy first onto the mtm.db, then the mtm.app and finally the mtm.web component. If you need to change the order click any of the Deployment Sequence icons and edit as required. Now since the OpenStack Heat engine has been extended with the special VCenter resource types , I need to externalize the properties into a configuration file and UCD+P will make sure that core OpenStack types are mapped to VMware VCenter types in the configuration file. 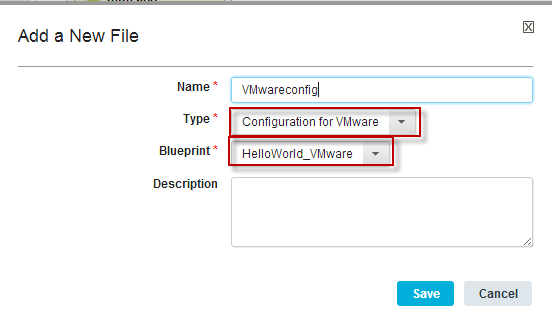 To do this click New.., select “Configuration for VMware” for Type, select the new HelloWorld_VMware blueprint, give it a name and click Save. 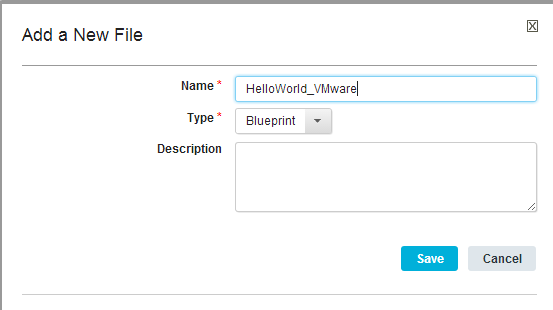 This will create a property file with just the core OpenStack to VMware vCenter types mapping in it. To add the properties from the associated blueprint to it click Add . Then change the property values as required. We also need to specify the name of the UCD application for which the new environment will be provisioned. This is done in the Source view of the blueprint. 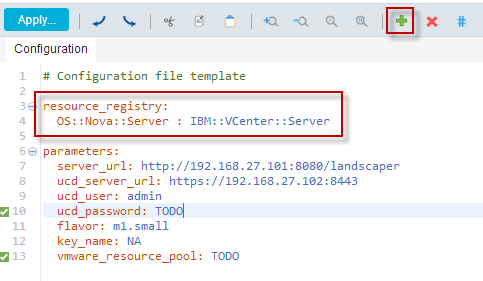 Select the Source tab and in the in the “resource_tree” section, change the value of the application property from TODO to “MTM” (quotes included). While I’m in the source view I’ll also take the opportunity to change the name given to the server to “mtmserver” using search and replace (Ctrl+F). Now I’m all set. Click Provision.., specify a name for the new environment , select the Configuration file created above, change any property values if required and click Provision. 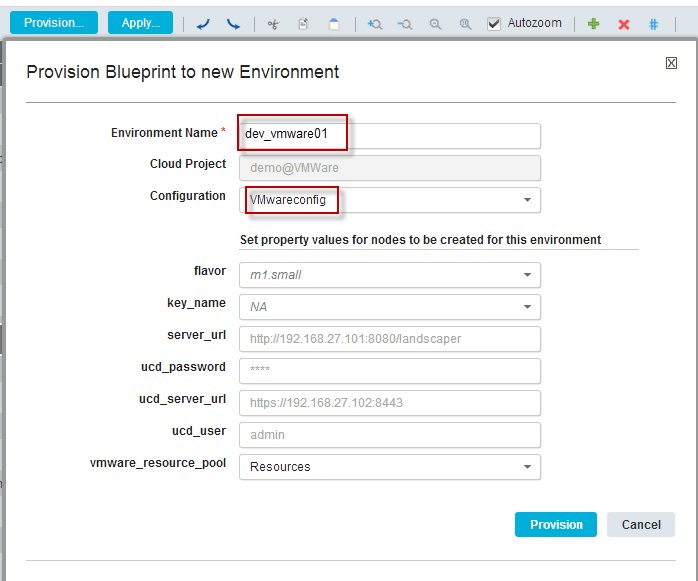 The blueprint is validated and if there are no errors UCD+P connects to vCenter and UCD to begin provisioning. 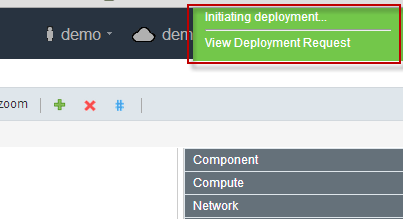 A couple of informational sliders show up at the top-right of the window and clicking the View Deployment Request link displays the provisioning in progress. 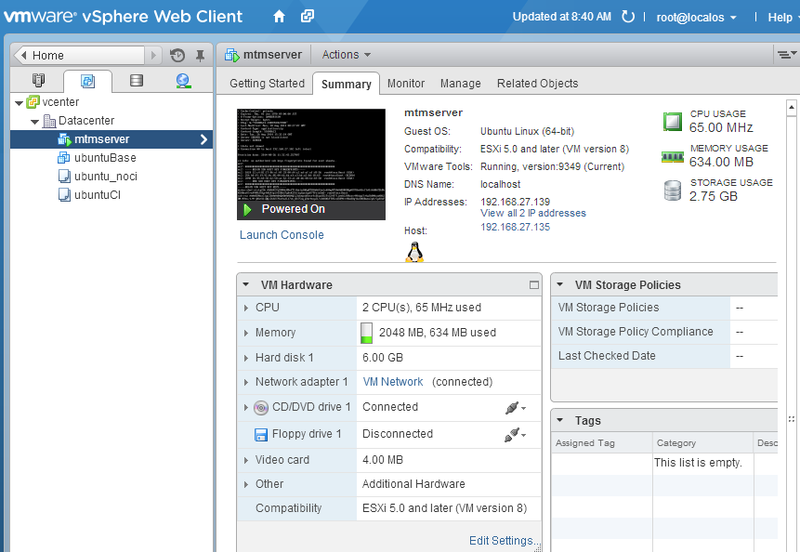 The new VM shows up in vCenter. Given a few minutes (or more depending on the complexity of the component processes) the agent comes on-line, registers itself to the UCD server and the component processes are kicked off in the order specified. On completion the UCD Resources page shows the new resource with the “1.0” version of the “mtm. *” components deployed on it. And finally the UCD Environments page for the MTM application shows the state of the new environment. I used a graphical editor to do most of the HOT creation and editing, with an “intelligent” text editor still available to work directly with the HOT source. 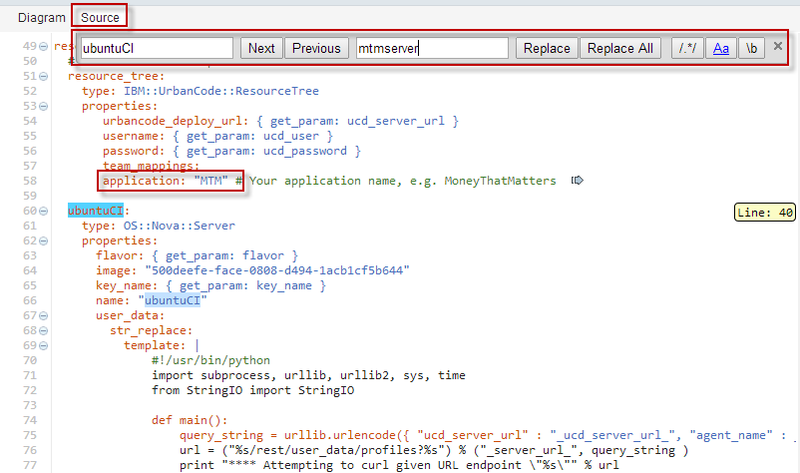 In UrbanCode Deploy with vSphere and Chef I cooked up my own XML “blueprint”. I don’t need the generic UCD process and associated PowerCLI script to create a new VM and install the UCD agent into it. 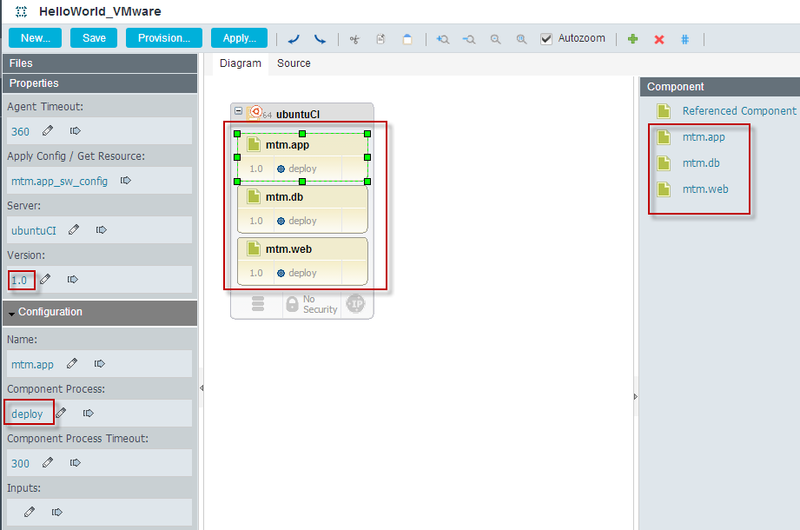 Once the blueprint is designed UCD+P takes care of all the VCenter interactions. I also don’t need to create the new environment from a UCD blueprint. UCD+P takes care of creating the environment, resource group and putting the agent resource in the right place. Next Next post: What’s up Doc(ker)?